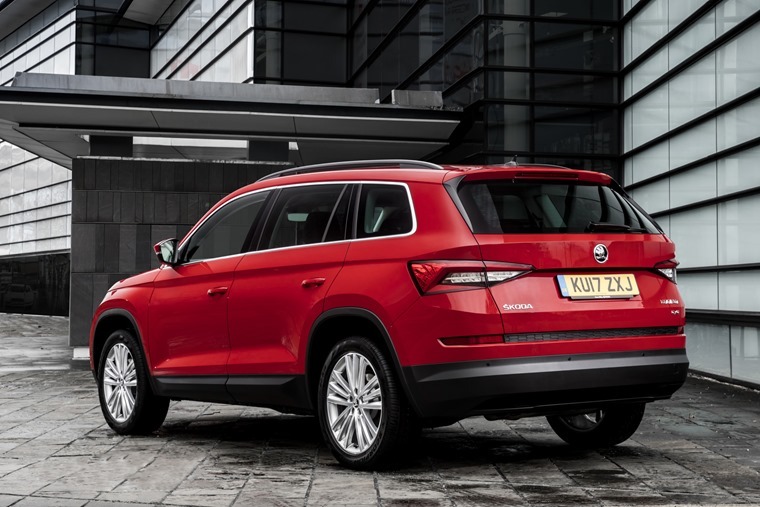 The Skoda Kodiaq does everything you need it to competently and in style. Could this be the perfect car at the perfect time? The world loves SUVs, with sales in the UK increasing by 20% each year. There’s also a seemingly concerted effort to demonise diesel, with stories of horrendous pollution issues and threats of punitive taxes and charges to come. On top of that, the economy is on a knife edge, with many concerned at the drop in value of the pound and the ramifications of the forthcoming Brexit. 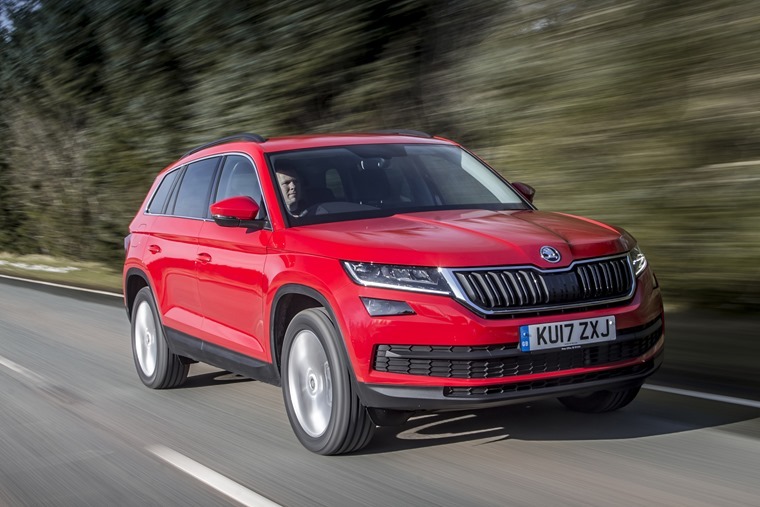 In the light of these three issues, Skoda has turned up with an enormous SUV that packs in four-wheel drive and seven seats, priced incredibly competitively, and has a 178bhp petrol engine under the bonnet. In many respects it’s safe to say that Skoda has built the right car at the right time. Even with all seven seats in place, the boot is pretty sizeable too. It’s on a par with the Discovery Sport, but can hold much more once those rear seats have been folded down. A waiting list of three months suggests that demand is there but few motorists have driven the thing. The on-paper offering must be strong, but how does that translate to real world experience? Despite its gargantuan appearance, the Kodiaq sits somewhere between an Octavia and a Superb in terms of length, but it manages to squeeze in enough seats to accommodate seven people in actual comfort. Yes, the back seats will probably be for the exclusive use of children. But in our test, we found it was fine for the occasional short journey with a car full of adults too … it’s nice to know you could fit in a small board of directors if needed. Even with all seven seats in place, the boot is pretty sizeable too. It’s on a par with the Discovery Sport, but can hold much more once those rear seats have been folded down. Those in the middle row have plenty of room around them, while the driver and front passenger can wallow around in a seriously spacious and well-appointed cabin. While the 2.0-litre petrol engine might sound a bit light on power with just 178bhp available, there’s enough torque low down to get things moving quickly enough, with 62mph passing by in a blur. Up front is an industrially designed dashboard, or at least that’s what the straight lines and almost clinical layout feels like. That’s not to say it’s ugly, as it’s not; it’s a fine piece of design that works with the external styling well. However, while there’s no doubting that the build quality will be up to Skoda’s usual high standards, tapping the expensive-looking materials reveal that they’re just thin veneers on an otherwise plastic dashboard. That’s the difference between the Audi and Skoda brands, if anyone ever asks. It all combines to make the big Skoda as family friendly as Peppa Pig. Skoda’s have another difference that it calls ‘Simply Clever’. 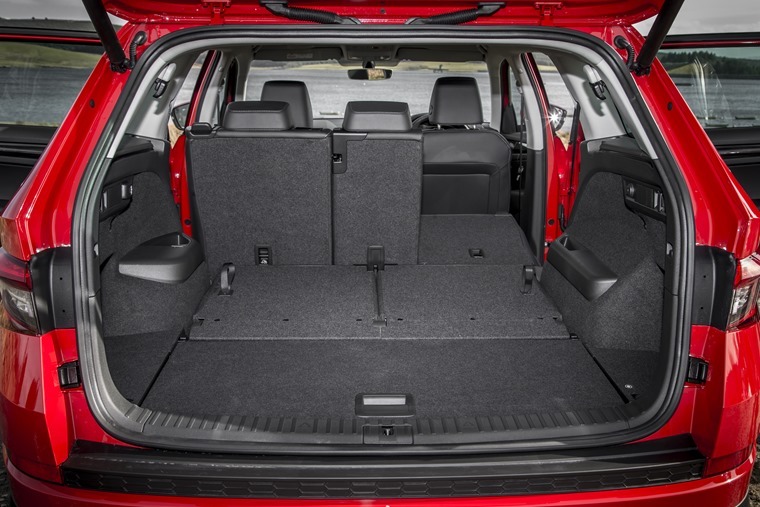 It’s a philosophy of making family life easier, so the Kodiaq comes littered with storage bins, luggage hooks, an ice scraper hidden in the fuel filler flap and even umbrellas hidden in the doors on higher spec models. It all combines to make the big Skoda as family friendly as Peppa Pig, while the petrol engine means the car avoids sounding like a piece of farmyard machinery. While the 2.0-litre petrol engine might sound a bit light on power with just 178bhp available, there’s enough torque low down to get things moving quickly enough, with 62mph passing by in a blur after just 8.2 seconds. 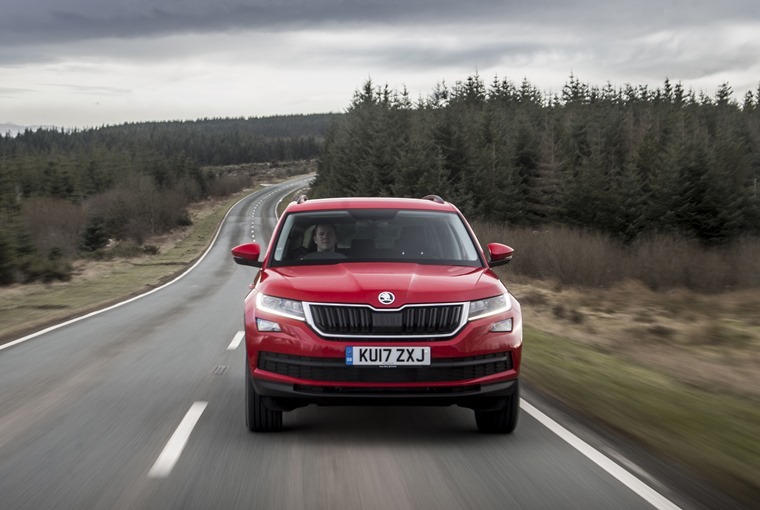 There’s plenty of power at the top end to keep pushing the Kodiaq on to antisocial speeds, although the seven-speed automatic gearbox doesn’t always manage to keep up with demand. The lethargic gear changes can be improved by switching the car to Sport mode, but this test car has the optional Dynamic Chassis Control system added and that results in a ride that's too firm with steering that’s too heavy. It does help handling slightly, but ploughing into a corner at speed still results in a predictable and composed drift towards understeer, with the computers making their best efforts to keep things in line. 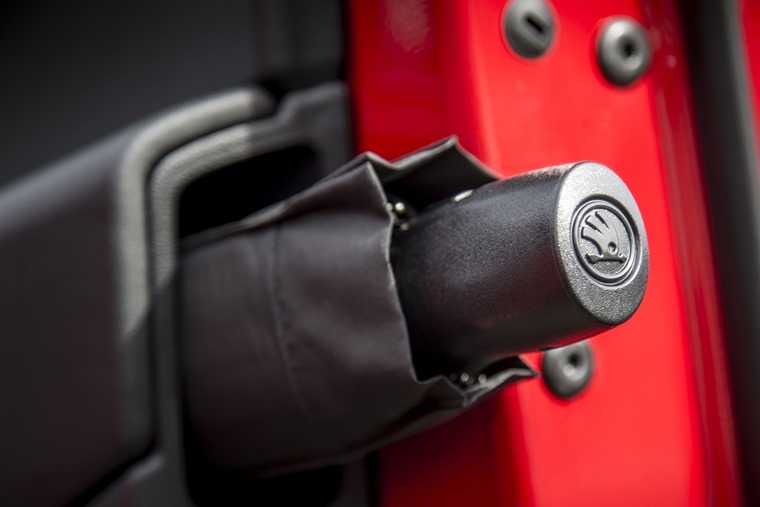 In SE-L spec, as tested here, you’ll be getting something that’s loaded with equipment - there’s satellite navigation, heated seats, keyless entry, electric tailgate, in-car wifi and cruise control. To aid with that further, there’s four-wheel drive. However, on the perfectly dry and grippy tarmac underneath a perfectly crisp and clear spring sky, it didn’t add a great deal to proceedings. In poor conditions it’ll add a degree of surety, and it will come into its own as you cross a damp field, but it’s probably fair to say that most drivers in the UK will get on just fine with the cheaper and lighter front-wheel drive models, and wouldn’t miss the active suspension system. In many respects it’s safe to say that Skoda has built the right car at the right time, just choose your model wisely. Sadly, unless you see a lot of urban driving ahead it’s probably best to steer clear of the petrol engine. Economy barely scrapes into 30mpg territory, whereas the 2.0-litre diesel unit will manage 40mpg or more with ease. It’s a little down on power, with just 148bhp available, but there's a huge amount of torque and it seems to work better with the gearbox, allowing you to access that thrust without any undue delay or discomfort. In SE-L spec, as tested here, you’ll be getting something that’s loaded with equipment - there’s satellite navigation, heated seats, keyless entry, electric tailgate, in-car wifi and cruise control. It’s also about as safe as you can get, with enough acronyms to keep a quiz team going for a week – there’s ESC, ABS, MSR, ASR, EDS, HBA, DSR, RBS, MKB and many, many more. The Skoda Kodiaq is stylish in a rather functional way, is an incredibly practical family car, can double up as a van and, if you resist the temptation of the 4x4 system and some unnecessary options, is cheaper to lease and run than this test model. So yes, in many respects it’s safe to say that Skoda has built the right car at the right time, just choose your model wisely.